The images of two teenage suspects were captured on area surveillance tapes. Spokane police said Friday they have arrested one of two teenagers wanted as suspects in the beating death of an 88-year-old World War II vet who was wounded at Okinawa. Delbert Belton, known as "Shorty," died Thursday from head injuries suffered in the attack Wednesday night outside the Eagles Lodge. KHQ-TV reports that the 16-year-old is being held in juvenile detention but will be charged as an adult and faces first degree murder and first degree robbery charges. Police had released the photos of two teenagers seen in area surveillance footage. Police say they received a call about an assault and found the victim sitting in his car. The medical examiner said Belton suffered "blunt facial and head injuries" and ruled his death a homicide, The Spokesman-Reviewreports. KXLY-TV quotes witnesses as saying two black male suspects attacked Belton as he was about to head inside the lodge to play pool. KHQ-TV reports that police believe the assault was a random attack. Police, who have examined surveillance footage, say they are looking for two possible suspects between the ages of 16 and 19. A friend, Ted Denison, told The Spokesman-Review that Belton was shot in the leg during the fighting in Okinawa in 1945. "He was a tough old bird, I'll tell you that," he told the newspaper. The newspaper says Belton was waiting outside the lodge for a friend because he did not want her to walk in alone. There are so many comments I could make about this crime... none of them NICE! So I will say this, "Punish these individuals to the highest extent of the law. When they are released require them to enlist in the Military and ship them off to defend our country! If they survive, let them be beaten to death in front of a place they consider Hallowed Ground!" I HATE stories like this and feel hatred towards the maggots who commit such crimes !! 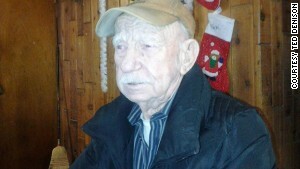 A juvenile has been arrested by Spokane police in connection with the beating death of an 88-year-old World War II veteran this week, police said Friday. The male suspect has been charged with first-degree robbery and first-degree murder. The man -- Delbert Belton -- was beaten and left for dead by two teens outside a lounge in Spokane, Washington, where he loved to go play pool. A retired aluminum company worker who served in the Pacific, Belton, friends say, took a bullet in the leg during the Battle of Okinawa. He survived that attack. But on Wednesday night, Belton -- affectionately called "Shorty" by friends for his height -- headed to the Eagles Lodge, where he was a regular. Police found him in the parking lot, with serious head injuries. The Spokane County Medical Examiner's Office on Friday said the cause of the death was blunt facial and head injuries. It also said in a news release that the manner of Belton's Thursday death was homicide. "It does appear random," Spokane police Lt. Mark Griffiths told reporters. "It appears he was assaulted in the parking lot and there was no indication that he would have known these people prior to the [You must be registered and logged in to see this link.]." Officers had been using dogs to search for the suspects, swept for fingerprints on the chain link fence in the area where they were last seen headed, and scoured through surveillance tapes. It's the second time in a week that a seemingly random attack by teenagers has claimed a life. On August 16, a 23-year-old Australian baseball player attending college in Oklahoma was [You must be registered and logged in to see this link.]. One of three teens police arrested in that shooting said they carried it out because "we were bored and didn't have anything to do." The randomness of the two attacks was not lost on Ted Denison, who's been friends with Belton for a long time. "It's really depressing," Denison told CNN late Thursday night. "Seems that all there is is bad news." The two men met more than 20 years ago and worked on cars together. "We were mechanic buddies," the 42-year-old Denison said. "We just kind of kicked right along." But the friends also hung out together outside the garage. "We went dancing on Saturday nights," Denison said. "We went out to breakfast together." Belton stopped by the Eagles Lodge two or three times a week. He played pool, but by his own admission, wasn't too good at it. "He went up there and played pool, met with some of the guys he used to work with at Kaiser Aluminum," where he was employed more than 30 years, Denison said. His wife died several years ago. The World War II veteran is survived by a son, 65. Barbara Belton, Delbert Belton's daughter-in-law, told CNN's Alina Machado in a phone interview that Delbert's friends first called her about the attack. The news was shocking and disorienting. "It's almost like you're not really focusing in on what they're saying," she said from the Spokane area. "It didn't seem real." Later, she said, an intensive care unit doctor told her that he had been beaten so badly, doctors "couldn't stop the bleeding." "He was upset," she said. "It's a terrible way to have to die." Asked what she would say to the perpetrators, she said: "What motivates you to do such a horrendous thing to an old man?" "He didn't drive a big fancy car. He didn't dress in expensive clothes. He didn't have a lot of money. He had very little money," she said. "What did they think they were going to get from this man?" On Wednesday night, Belton was outside the lodge waiting for a friend because he didn't want her to walk home alone, Lillian Duncan [You must be registered and logged in to see this link.] newspaper. "He was so awesome," Duncan told the paper. "Anybody that didn't get to know him missed out on a wonderful angel in their life." Outside the lodge Thursday, friends and strangers alike left flowers, flags and messages for Belton. Belton never had problems outside the lodge before -- no threats, no altercations, Denison said. "If he had, I would have made sure I was there." An American Flag Bandana REALLY? SPOKANE, Wash. — When Glenn Longstorff's mind goes back to that room at the hospital a few nights ago, he hurts for his friend, the man people around here knew as Shorty. He thinks of the kid drafted to war at 18. The soldier shot in the leg on the beach at Okinawa, who never cared to say too much about it. The fixture around town — at the Sportsman Cafe & Lounge for coffee almost every morning, and at the Eagles Lodge on many nights. Delbert Belton, 88, was in his car outside the lodge watering hole Wednesday night, waiting for his girlfriend to meet him to shoot some pool, when he was robbed and beaten. Hours later, he died at the hospital. Longstorff was at his friend's side. "The way they beat him and how they beat him — it's absolutely terrible," said the 62-year-old railroad worker who had rented a room from Belton for five years. "Everybody's just appalled. Man's not supposed to kill man." The killing of the World War II veteran has struck a nerve in Spokane, close to Washington's eastern edge, where a homegrown memorial has sprouted and grows outside the lodge and where locals gathered Friday for a memorial service. Feelings of anger and confusion have spread far beyond this neighborhood of faded storefronts and modest homes as people struggle to make sense of the apparently random but stunning act of violence, which police say was perpetrated by two teenagers. "People keep coming during the day, and laying more stuff," said Roger Chinn, 52, a janitor at the Eagles Lodge. Authorities here said that Belton was assaulted after 8 p.m. Wednesday. Found by his girlfriend, he was bloodied but still responsive. She ran for help, screaming. Spokane police confirmed Friday that a 16-year-old boy was taken into custody in the case. Officials have also identified a second suspect, also 16, who remains at large. "We would encourage [the suspect] to surrender immediately," Spokane Police Chief Francis Staub said in a statement, adding that police would tirelessly hunt the young man down. On Friday night, scores of people — some friends, others just from around the neighborhood — huddled in the breeze in the parking lot outside the lodge. They belted out Lee Greenwood's "Proud to Be an American" and a verse of "Amazing Grace." They also swayed along to country music blaring through speakers, because, they said, Shorty loved to dance. Belton had worked for 30 years at an aluminum-manufacturing plant. He stayed busy in retirement, often stopping by the Department of Veterans Affairs clinic, where he'd chat with patients and joke with staff. According to Longstorff, he enjoyed fixing up old cars and then just giving them away. It was the company of his friends that helped him cope with the death of his wife, Myrtle, about six years ago, said Barbara Belton, his daughter-in-law. She has struggled to make sense of Belton's death. For one, he certainly didn't look like a man of means. His car was anything but flashy: a '94 Ford Contour. "He didn't dress fancy," she said. "Why these kids thought he had some money, I don't know." At the Friday night memorial, people were invited to come stand by the American flag and say a few words about their friend. They stood under the inky sky, holding candles burning in paper cups. They talked about his hobbies, his personality and how much they'd miss him. "That man did right, he did it for his country and he made an impact on a lot of lives," one man told the crowd. "God bless Shorty!" This is just awful. Such a sweet old guy waiting for a woman so she wouldn't have to walk there alone. What is going on with all these attacks on innocent people? Is this supposed to be retaliation for Trayvon? Gang related? It makes me sick. I don't want to get into a racial debate with anyone, but yes Sam that is my belief. LE and the Media keep down playing these crimes and in every statement issued they say "The Crime Was Not Racially Motivated." The black teens responsible for gunning down this young man told LE "They were bored"
The Daily Caller reported that racist tweets were posted on an account belonging to Edwards. One tweet from the account reads, "90% of white ppl are nasty. #HATE THEM." Another post read, "Ayeee I knocced out 5 woods since Zimmerman court! :)"
The Daily Caller's report noted that 'woods' is used as a derogatory term for white people. Why is the public being told these crimes against WHITES are not racial when the facts speak otherwise? It would appear that people in high places don't want to label these events for what they are in an attempt to stifle conflicts between the 2 races. I don't think this propaganda will be long lived, people will see what's happening, they are already. Will our President stand before cameras and say "This young ball player could have been my son" or "This old man could have been me one day" ? NOPE that is not going to happen! Police have arrested a second teenage suspect in the fatal beating of an 88-year-old World War II veteran outside an Eagles Lodge in Spokane. The victim, Delbert Belton, was attacked and robbed in the lodge’s parking lot last Wednesday night. One of the suspects, a 16-year-old boy, surrendered to authorities Thursday night, and he was being held on charges of robbery and first-degree murder. His identity has not been released because he is a juvenile. Several other people with him were arrested for investigation of rendering criminal assistance, Spokane police spokeswoman Monique Cotton said. Officers found Belton with serious head injuries, and he died in the hospital Thursday. Both teens have juvenile court records and past convictions for assault, Chief Frank Straub said last week. His death sparked outrage in the community. “He was defenseless,” Hansen said. A 16-year-old Spokane boy was ordered held on $2 million bail Monday and will be tried as an adult in connection with last week's beating death of an 88-year-old World War II veteran. A second teen was arrested in the case early Monday morning. "The evidence doesn't indicate what happened," Phelps said, adding that eyewitnesses only reported "two kids running away." "Our information indicates the individual fought back and that may have made this a worse situation," Straub said. Police received a tip early Monday about Adams-Kinard's location, Straub said. Three other juveniles in the house with the suspect Monday were arrested for investigation of rendering criminal assistance, a felony. The lawyer for one of the 16-year-olds charged with fatally beating World War II veteran Delbert Belton said there's scant evidence against his client. "There are no eyewitnesses and no forensic evidence that links either of the kids to the crime," said Christian Phelps, who is representing Demetruis Glenn. Glenn and buddy Kenan Adams-Kinard are charged with first-degree murder and robbery in the slaying of the 88-year-old grandfather, who was found bloodied in his car outside the Fraternal Order of Eagles Lodge in Spokane, Wash, last week. Adams-Kinard will make his first court appearance Tuesday, and police have said they expect he will be charged as an adult. Glenn was charged as an adult, and his lawyer said he plans to plead not guilty. Both teens were captured on security cameras near the lodge around the time Belton was killed, and police said Glenn had cuts on his hand. Phelps would not say what his client was doing in the area. "A lot of folks just want to throw these kids away and the key — or worse," the attorney told NBC News. "I would urge people to wait for the facts to develop." Glenn surrendered the day after the attack, but Adams-Kinard spent four days on the run before police caught up to him Monday. His family said he does not yet have a lawyer. "He'd fallen in with the wrong crowd," said his uncle, Odell Kinard. "It's the summer and ain't nothing to do here. "He has to take responsibility," he added. "But the family is praying he gets 10 years or less." Spokane Police Chief Frank Straub has described the teens — who have prior convictions for assault — as "two young men who just spun out of control." He said the motive was robbery and Belton was beaten to a pulp when he put up a fight. The veteran's death drew national attention because of his age and the fact that he survived being shot during the Battle of Okinawa only to be randomly killed on his way to shoot some pool. Some commentators also seized on the fact that the suspects are black and Belton was white, though Straub said unequivocally that race was not an issue. The police chief said the tragedy of Belton's murder was compounded by the age of the suspects — and issued a call to action for programs to help troubled youth. "He came close to losing his life in service to this country in Okinawa and then he gets killed needlessly in the parking lot while he’s waiting for a friend. That’s the tragedy of this thing," Straub said of the victim. "The second piece is two young men whose lives and the lives of their families are ruined by criminal activity." He said he planned to institute a mentoring program to ensure the city's youth have good role models. "We have a collective responsibility to make sure these types of events don’t happen and that our children don’t wind up in these situations," he said. "We have to wrap our arms around our children," he said. "Where families can't get it together, the community has to." "They just kept hitting and hitting him," Barbara Belton said. "He was an 88-year-old man. Even if they wanted his money and he didn't want to give it to them, they didn't need to do that." SPOKANE, Wash. (AP) — Investigators have discovered fingerprints linking two teenagers to an 88-year-old World War II veteran who was beaten to death last month, authorities said. Police said in an affidavit that Demetruis Glen and Kenan Adams-Kinard, both 16, killed Delbert "Shorty" Belton on Aug. 22 while he sat in his car. Investigators found Glenn's prints on the exterior rear driver's side door and the interior of the rear driver's side passenger door and Adams-Kinard's prints were on the exterior driver's door and the interior of the rear driver's side passenger door, according to the affidavit. Belton's body was found wedged between the front bucket seats, with his lower body from the neck down folded into the back seat area, according to the affidavit. Glenn and Adams-Kinard will be arraigned Sept. 12. Both face charges of first-degree murder and two charges of first-degree robbery. They are being tried as adults. According to court documents, Adams-Kinard claimed in a letter that he called Belton and arranged to buy crack cocaine from him Spokane police have said there is no evidence that Belton was a drug dealer. Belton was born in Sunnyside, Wash., and raised in Spokane. He survived being shot in the leg in 1945 at Okinawa, one of the fiercest battles of the war, and went on to spend 33 years working for Kaiser Aluminum before retiring in 1982. How can the family be praying this kid gets 10 years or less when he killed an unarmed man? I'm glad they are being tried as adults. Too many young, bored kids just killing anyone for the fun of it now, WTH is going on? I'm certainly not believing an 88 year old vet was a drug dealer. The two 16-year-old boys charged in the beating death of an 88-year-old World War II veteran have entered not guilty pleas and will be tried in November. Belton's body was found wedged between the front bucket seats, with his lower body folded into the back seat. The suspects' fingerprints were found on the doors of the car, court documents state. The teens were being held on charges of first-degree murder, first-degree robbery and conspiracy to commit first-degree robbery. The letter indicated Adams-Kinard had called Belton and arranged to buy crack cocaine. However, police have said there was no evidence that Belton was a drug dealer. I cannot believe they are claiming this man was a drug dealer! As if that explains or justifies what they did to him. The next time the two teens facing murder charges in the death of a World War II veteran see the inside of a courtroom together may not be until March, a Spokane County judge ruled Friday. Kenan Adams-Kinard and Demetruis Glenn, both 16, have pleaded not guilty to murder charges received after 88-year-old Delbert Belton died of injuries sustained in an alleged beating outside a north Spokane ice rink in August. Adams-Kinard and Glenn’s fingerprints were found on Belton’s vehicle, according to court documents, and Adams-Kinard contends Belton stiffed the two on a deal for crack cocaine, which sparked the violence. Attorney Derek Reid asked Spokane County Superior Court Judge Annette Plese for a continuance on behalf of Adams-Kinard on Friday morning in a juvenile courtroom. Christian Phelps, who is representing Glenn, said he’d prefer the trial take place as scheduled in two weeks, but did not raise an objection to Reid’s request. Prosecutors prefer the defendants, led into the courtroom handcuffed by security personnel Friday, be tried together. Phelps hinted to Plese on Friday that he might file a motion to separate the cases. Plese granted the continuance, which pushes the trial date tentatively to mid-March. The teenagers face life imprisonment if convicted. Both teens, age 16, were set to go to trial on November 4th, but now the trial has been delayed until Martch 17, 2014 after a ruling at their pre-trial hearing. The suspects in the beating and killing of Delbert Belton, a 89-year-old World War II Veteran, have different attorneys one pushed for a delay due to DNA evidence still not being available. Glenn and Kinard have been charged with beating Belton to death with a flashlight after an attempted robbery went badly. Kinard hid with friends for a few days before police located and arrested the teen. The accomplices were not charged by authorities. The flashlight was found by police and Glenn reportedly has an injury to his hand. The tragic death made headlines as Belton lived a meager lifestyle and had survived the Battle of Okinawa. Two Spokane teenagers charged with beating a World War II veteran to death were targeted for retribution by the Aryan Brotherhood. Kenan Adams-Kinard and Demetruis Glenn, both 16 years old, are charged with first-degree murder in the beating death of 88-year-old Delbert Belton last August. Their trial is scheduled for March 17 and they are being held in the Spokane County Jail. Belton was robbed and beaten to death in his car outside the Eagles Ice Arena in Spokane on Aug. 21. Belton was a survivor of the Battle for Okinawa during World War II. Errors in compiling and redacting more than a thousand pages and digital files of investigative material may keep the public from viewing records in the beating death of a World War II veteran until after a trial begins. Teenagers Kenan Adams-Kinard and Demetruis Glenn have been charged with first-degree murder in the death of Delbert Belton, 88, who was found battered in his vehicle in August. While the trial is tentatively scheduled to begin next month, a public records request filed by a local television station for access to 911 audio recordings, transcripts of interviews and other documents was put on hold Friday after an attorney for the city said her office had failed to provide defense attorneys with requested material. “This is a delay caused by the city,” city attorney Mary Muramatsu said in court. Redacted digital media files the city had intended to turn over to defense attorneys for review at first were handed over without any changes, then they were released in part. As a result, defense attorneys for Adams-Kinard and Glenn still have not seen all of the material the city intends to release to the public from the investigation. Glenn’s attorney, Christian Phelps, had originally petitioned the court for two months to review the documents and stipulate in court filings what should be released. Phelps echoed that request Friday, pushing the potential release of information in the case to mid-April, a month after opening arguments in his client’s trial are set to begin. If there are no concerns, defense attorneys could OK the release of investigative documents sooner than that. Belton’s death drew national media scrutiny last summer, and security officials at the Spokane courthouse claimed to have received death threats from the Aryan Brotherhood targeting the suspects. Adams-Kinard wrote in a letter police have linked to him that he began pummeling Belton after the senior citizen shorted him on a deal for crack cocaine. I still do not believe for one second that Mr. Belton was a drug dealer. It's so sad they are slandering him this way in an attempt to get away with murder. And really what kind of defense is that anyway, "I was buying crack and didn't like the deal I was getting so I beat my dealer to death?" Both suspects remain in custody pending trial. A Superior Court judge on Friday lowered the bond for one of two teenagers charged with murder in the August beating death of a World War II veteran outside a north Spokane ice rink. Kenan Adams-Kinard, 17, asked the court to lower bond on his criminal counts of murder and first-degree robbery. He has been held for nine months on $3 million bond pending an August trial date for his alleged role in the death of 88-year-old Delbert Belton. Judge Annette Plese lowered that amount to $1 million on Friday due to Adams-Kinard’s permanent address in Spokane and two juvenile misdemeanor convictions. He remained in custody Friday. Also jailed is 16-year-old Demetruis Glenn in connection with the slaying. Glenn surrendered to police and is being held on $2 million bond, according to jail records. Adams-Kinard was arrested at a friend’s apartment a few days after the alleged beating, and police have linked him to a letter in which it is claimed Belton cheated the two boys on a deal for drugs, prompting the violence. Digital files released this month in the case of two teens accused of beating to death an 88-year-old World War II veteran in Spokane last summer offer a compelling look into the lives of the suspects and an angry community. What they don’t show is new insight into why the violent death occurred. Among the files, a breathless 911 call relaying the violence visible inside Delbert Belton’s Ford sedan juxtaposes with the Facebook selfies and middle-school basketball tournament brackets downloaded by suspects Kenan Adams-Kinard, 17, and Demetruis Glenn, 16, who remain jailed on charges of killing Belton. “He’s not talking, but he grabbed my hand,” Natalie Flom can be heard telling a dispatcher on 911 tapes. She is a friend of Belton’s who first found him bloodied in the parking lot of the Eagles Lodge Ice Rink around 8:15 p.m. Aug. 21. Belton died the next morning. The evidence includes a photograph of a purported confession letter linked to Adams-Kinard. While Glenn surrendered within a few days of the beating death, police found Adams-Kinard in a friend’s basement apartment. After he walked out of the home to surrender, investigators searching the property found the handwritten note describing a drug deal gone wrong that has provided the only motive for the attack. “My intentions were to get a zip of crack and be on my way,” reads the letter, which has Adams-Kinard’s name signed at the bottom. The letter is written in a looping hand and blue ink that differs from the scratchy signature in the bottom-left margin. It describes the beating and claims Belton gave a smaller amount of drugs than was owed. Belton’s family and friends vehemently deny the claim that he dealt drugs. Police seized cellphones and combed the teens’ social media records. They found typical teen life: basketball game and practice schedules; pictures of 2012 Hoopfest warm-ups and high-top sneakers; selfies in sports gear; even a syllabus for an entry-level community college communications class. And they found some troubling posts, including pictures of a teen holding large daggers in a bedroom, and others showing marijuana buds next to cheeseburgers. When news of the killing broke and police announced they were searching for two black teens, public fury exploded. False tips and bogus speculation on the Internet came from across the region and even as far away as Texas. After Spokane police indicated they were looking for Adams-Kinard, a Facebook page popped up with the teen’s picture and several posts antagonizing users. The account was distinct from Adams-Kinard’s personal Facebook page, which investigators also monitored. Posts on the apparent fake page included threats to hang the teen in Riverfront Park, or crucify him. Other posters advocated that the teen be raped, tortured – even mutilated – in prison. All of those social media posts were reviewed by investigators, downloaded and catalogued as evidence by police. “Where is (George) Zimmerman when you need him!” wrote one of the less profane users on the page, referring to a jury’s July 2013 acquittal of a Florida neighborhood watchman who shot and killed unarmed black teenager Trayvon Martin. Of the many Crime Check tips received by police, one came from a woman claiming she knew one of the suspects but would not turn him in. Her post on the Facebook page of Spokane News named a black man who has been not linked to the beating death. That unsubstantiated claim prompted many tipsters to urge police to look at and act on the information on the website. Detectives found Glenn’s and Adams-Kinard’s fingerprints in multiple locations on the outside of Belton’s car. Surveillance video captured by area fast-food restaurants and other businesses show the two entering the parking lot where the beating took place around 8:15 p.m. and then running away, but do not record the moments when the alleged crime took place. Despite thousands of pages of social media posts, phone records and hours of audio and video, however, the evidence released provides no clear reason for Belton’s death. Minutes after his arrest, a lethargic Adams-Kinard is seen sitting in an interrogation room with two Spokane police detectives. They give him a chance to speak about what happened. “I’d like to wait and speak to my lawyer,” Adams-Kinard said. Two Spokane teenagers accused of killing a World War II veteran will stand trial in January. Kenan Adams-Kinard and Demetruis Glenn, both 17, appeared in court Wednesday in advance of their scheduled trial for the murder of Delbert “Shorty” Belton on Jan. 12. The teens are accused of beating Belton to death in his car after robbing him in August 2013. Both are being tried as adults. Their scheduled trial has been pushed back several times, but all three attorneys involved said Wednesday they were ready for trial. Jury selection is scheduled to begin Jan. 12. A plea bargain is in the works for at least one of the teenagers suspected in the 2013 beating death of World War II veteran Delbert “Shorty” Belton. The teen, Kenan Adams-Kinard, is expected to plead guilty to a murder charge in connection with the 88-year-old veteran’s death in exchange for an accompanying robbery charge being dismissed, court officials said today. A hearing is set for Tuesday in front of Judge Sam Cozza. Adams-Kinard and Demetruis Glenn, both now 17, are charged as adults in connection with the slaying, which drew international attention, but the cases are being handled in the county’s juvenile court. Belton was found severely beaten in the parking lot of a Spokane ice rink the evening of Aug. 21, 2013, where he’d been waiting for friends. Kinard’s trial was scheduled to start next week. The status of Glenn’s case was unclear this afternoon. Investigators discovered both boys’ fingerprints on Belton’s car. Adams-Kinard and Glenn have been in custody since their separate arrests a few days after the homicide. Glenn turned himself in to authorities after surveillance video surfaced of the two teens entering nearby businesses around the time of the alleged beating. Adams-Kinard was apprehended in a basement apartment a few days later, where authorities found a letter they tied to the teen that alleged the beating took place after the elderly World War II veteran stiffed Adams-Kinard on a crack cocaine deal. Friends and family of Belton have called the drug claims preposterous. NO plea bargain! These two should get the DP!! They want to drop the aggravated robbery charge so the DP is off the table. The opportunity to serve life in prison is too good for this guy! Demetruis Glenn is likely to follow suit after he see's what punishment Kinard gets. It was such a sad ending for a man who bravely served our country, survived the war and lived an honorable life. Two thugs who wanted what little money an old man had on him, were willing to beat him to death to get it. Where are the protesters, looters and race-baiters? Appearing stoic and answering a judge’s questions with a monotone “Yes, sir,” young Kenan Adams-Kinard pleaded guilty Wednesday to murdering World War II veteran Delbert “Shorty” Belton. The 17-year-old Adams-Kinard faces a likely sentence of 20 years in prison, according to the recommendations of his plea bargain reached with prosecutors. Robbery charges were dropped. Adams-Kinard and an alleged accomplice approached Belton, 88, in his car, parked outside the Eagles Lodge in north Spokane, and beat him on the night of Aug. 21, 2013. Belton died from his injuries the next day. The 20-year prison recommendation is at the low end of the standard sentencing range that stretches to about 28 years. A judge will decide the prison term later this year. Prosecutor Larry Haskell said the recommendation took into account teenage “maturity and impetuosity” and was at the low end of the range because Adams-Kinard did not use a weapon and grew up in a troubled home environment. The teen was charged as an adult. Until he is 21, he will serve his time at a juvenile facility. The hearing grew tense after Adams-Kinard pleaded guilty, with a brief but loud argument erupting inside the room between several of his supporters and a relative of Belton’s. The relative began yelling loudly that an Adams-Kinard supporter had “flipped her off” and threatened her, which that supporter denied. Other Belton relatives urged her to calm down, while court staff escorted the Adams-Kinard supporters from the room. Belton’s relatives declined to comment on the plea and said they planned to make a statement at the sentencing hearing, which has not yet been set. Ezra Kinlow, a pastor at Holy Temple Church who married Adams-Kinard’s parents, said he had no comment on Adams-Kinard’s guilt or innocence, but said he felt “sad” watching the plea. “I think the public convicted him before his time,” he said. But Kinlow apologized to the Belton family and said there was no justification for Belton’s death. “We make mistakes, some more serious than others, but we feel also that if you do the crime, you pay the time,” he said. Another 17-year-old charged in the homicide, Demetruis Glenn, is scheduled to stand trial beginning Monday. Police officers ask the friends and family of World War II veteran Delbert “Shorty” Belton to remain behind while the family and friends of Kenan Adams-Kinard are escorted from the courtroom Wednesday, in Spokane. Police wanted to make sure tensions didn’t escalate. Adams-Kinard pleaded guilty Wednesday to murdering Belton. 20 Years?? There is NO Justice! Lots of people grow up in troubled home environments, this is no excuse for beating an elderly person to death. I certainly understand the anger Mr. Belton's family and friends must be feeling. The Prosecutor didn't need to make a deal with this guy for pleading guilty to murder. I feel certain a jury would have rendered that verdict. The trial for teenage murder suspect Demetruis Glenn was pushed back to March 10 today at the request of Glenn’s attorney, Christian Phelps. Glenn, 17, was scheduled to stand trial with co-defendent Kenan Adams-Kinard starting Jan. 12 for the 2013 murder of World War II veteran Delbert “Shorty” Belton, 88. But Adams-Kinard pled guilty to the murder on Wednesday in exchange for the prosecution dropping robbery charges against him. That plea changed the complexity of the case, Phelps said Thursday, and means he needs more time to prepare for Glenn’s trial. He requested a new trial be scheduled for after Adams-Kinard’s sentencing, which is expected to be in mid-February. Prosecutor Mark Cipolla said he expects Glenn’s trial to last seven or eight days. The second teen accused of beating a World War II veteran to death during a robbery in Spokane accepted a deal Monday and pleaded guilty to murder. In return for the plea from 17-year-old Demetruis Glenn, prosecutors dropped a robbery charge. The Spokesman-Review reports (http://bit.ly/1Ebkom2 ) prosecutors will recommend a 16-year prison term when Glenn is sentenced March 19. The first 17-year-old prosecuted in the case, Kenan Adams-Kinard, also pleaded guilty to murder. He was sentenced last month to 20 years in prison. Prosecutors say the two killed 88-year-old Delbert "Shorty" Belton in August 2013 outside an Eagles Lodge. They say Belton, who survived the Battle of Okinawa, was killed for his wallet. The atmosphere in the courtroom was somber as Demetruis Glenn, the second teenager accused of killing World War II veteran Delbert “Shortly” Belton, was sentenced to 16 years in jail Thursday. Glenn, 17, pleaded guilty to first-degree murder on March 2. His sentencing draws to a close a case that sparked community outrage, garnered national attention and at times led to heated exchanges in court. Glenn and his co-defendant, Kenan Adams-Kinard, 17, were accused of severely beating Belton, 88, during a strong-arm robbery as Belton sat in his parked car at the Eagles Lodge in August 2013. Belton later died from his injuries. Adams-Kinard pleaded guilty earlier this year and was sentenced to 20 years in jail. Family and friends of the slain veteran spoke about the pain Shorty’s death caused in their community, but they left court with one small victory. Glenn’s attorney Christian Phelps said the claim that Belton dealt crack, made in a letter attributed to Adams-Kinard, was not true and was never part of Glenn’s defense. “Today, we can put that to rest. It’s on the record now,” said Steve Belton, Belton’s nephew. John Erp, a service officer for Disabled American Veterans in eastern Washington, spoke about Belton’s military service, where he survived the Battle of Okinawa - one of the bloodiest battles of World War II. Martha Denison, a friend of Belton’s, addressed Glenn directly. “I say a prayer for you and your friend every night: that I can get over it and you can get over it,” she said, fighting back tears. Glenn said only, “No thank you, ma’am,” when asked if he would like to speak. Before the hearing, he wrote a letter to the court saying one of the reasons he took the plea deal was so that the Belton family would not have to sit through a trial. Steve Belton said though he wanted to see Glenn go to trial, he was glad to have some closure in the case. “It’s not what we hoped for. I think the police and the prosecutors are working with one hand ties behind their back, but they’ve done their job,” he said, adding that the family is immensely grateful to law enforcement for their work on the case. Spokane County Superior Court Judge Annette Plese followed a joint recommendation for the 16 year sentence, though the lower end of the standard sentencing range for first-degree murder is 20 years. Attorneys for both sides said the recommendation took into account the fact that Glenn turned himself in to police. Phelps also said physical evidence suggested Glenn was present at the scene of the murder, but did not participate in the beating that killed Belton. “Your accountability in this case is a little less than Mr. Kinard’s,” Plese said before handing down the sentence. Glenn was also ordered to pay about $6,000 in fines and restitution. After the sentencing, Erp said he’s gotten regular calls from veterans asking about Belton’s case. “When one of us dies, a little bit of all of us dies,” he said.